With Xmas less than 3 weeks away and present buying in full swing, here at Wineware we’re suggesting our ‘Top 5 Christmas presents for her’. Buying gifts for your other half can sometimes be stressful and tough, but we’ve listed below 5 different options that we believe will be perfect for your mum, wife, girlfriend or sister! We feel that we’ve covered most bases, specialist champagne glasses, traditional and modern Wine Decanters, a champagne selection gift set and an easy to use, lever model corkscrew! 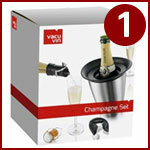 This VacuVin accessories gift box includes all you ever need to enjoy Champagne, except from the bubbly itself! An easy to use champagne opener will prevent you from popping the cork and watching all your champagne drip down the side of the bottle. The champagne saver allows you to easily pour from the bottle to the glass. A champagne cooler, so once you’ve poured your champagne, pop your bottle into the stainless steel cooler and sip your bubbly whilst your bottle is chilling! Why buy? 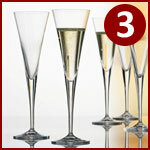 Has all the Champagne essentials included, with £16 off the SRP! This quirky and novel wine decanter from Dartington is an ideal vessel to serve your favourite wine from. 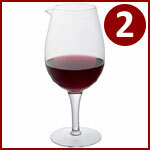 An extended large wine glass, it features a lip on the rim so you’re able to easily and effortlessly pour your wine from the carafe to the glass. The decanter allows for good visibility of wine colour & condition, excellent aeration and a non drip pouring lip. It holds up to 1800ml and is presented in a gift box. Why buy? 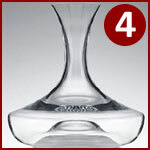 This modern decanter looks great on a dinner table! The popular ‘Taper’ Champagne glasses from Spiegelau make your table setting look elegant and stylish, perfect for that celebratory drink! The champagne flutes are machine made from crystalline and hold up to 165ml of your favourite bubbly, if you manage to keep it in the bottle once you’ve popped it of course! Available in boxes of 6, these glasses will certainly raise a smile as well as toast on Christmas day. The Celebration wine decanter from Eisch Glas is hand crafted in Bavaria Germany and holds up to 1500ml. This stunning decanter features a flat opening and indented base, so the wine interacts as soon as it’s poured from the bottle into the decanter. The wide bowl means it’s easy to hold and pour, so you’ll be able to pour your wine from the decanter to the glass using one hand in no time! Why buy? This stylish and elegant traditional wine decanter is reasonable priced considering it’s handmade. This easy to use modern lever model corkscrew from world renown manufacture Le Creuset, is great at extracting both synthetic (plastic) and natural corks. 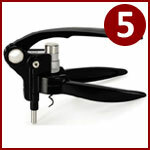 This corkscrew has classic style and is both durable and long-lasting due to way it’s been constructed. It comes with a 10 year manufacturers guarantee so you’re lucky will recipient will be opening their favourite bottles of wine for year to come! Supplied with a foil cutter and presented in a gift box. Why buy? Easy to extract the cork from the bottle, also includes a foil cutter! So that concludes ‘Wineware’s Top 5 Christmas presents for her’, we’re sure that our selections are a little different to the norm and will be sure to add a smile to her face this Christmas! If you can’t decide on what to buy her, why give a Wineware Gift Voucher instead and let her choose for herself! Additionally, click to see our collection of Christmas Gifts for other goodies, including our Christmas Stocking Fillers.